We’ve said it before and we’ll say it again… and again… and again… #brokenrecord - because it really is one of our FAVE Three Birds tips: spray your bricks! Nothing says ‘dated’ like bright orange brickwork, but no drama Mama, one of the best ways to transform an ugly brick exterior is to spray those babies. We came across this idea when our budget was tight and we couldn’t afford to render the properties we were flipping. Lots of people think you need to render a brick house to modernise it and add value, but rendering is costly and takes a lot of time – spraying bricks is faster, cheaper and looks great, when done properly. And the best part about this budget friendly tip? If you’re really pinching the pennies, you can DIY! Click here to find out how. First impressions count, right? So what better way to impress your guests than with a brand spanking new entrance to your home. Your front door is a fabulous way to show off your style and it’s an easy update on a budget. We had no idea the pretty pink door from House 5 was going to be such a hit with our followers, but it certainly made an impact and guess what? It was under $300 from Bunnings! A colourful front door is a gorgeous way to make your house stand out from the crowd and it’s budget friendly because you can paint it yourself! There’s no reason why you can’t change its colour every season to make your front door a fun fashion accessory for your house. 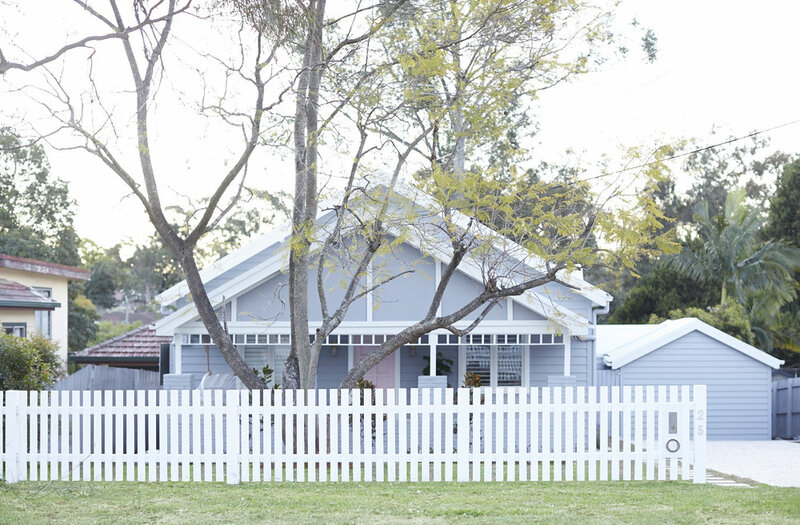 There’s something about a freshly-painted front fence that just makes your house look better. Defining your front yard not only adds value, it’s also practically a great idea for securing kids and pets. Call in a local carpenter or landscaper and they should be able to build a simple picket fence in a day. There’s nothing worse than standing outside someone’s house, not knowing how to get to the front door. Well-placed stepping stones are the perfect way to help guide your visitors, not to mention protect your front lawn from foot traffic. You can pick up pavers cheaply at your local tile supplier and since you’ll likely only need a handful, you might be lucky enough to score an extra good deal on end of line stock. Unless you’ve got something to hide (which you won’t have after following the tips above!) a dark entrance is never appealing or inviting. If your porch lighting isn’t cutting it, add a new wall sconce to light your entry way. You can also add a street number on the façade of your house in a well-lit area – it can add some charm (and the Uber Eats dude will appreciate it too!). So, there you go! Our easiest ways to banish your reno budget blues and get some bang for your buck. Which will you choose first?